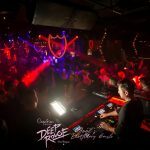 A pulsing night club against the background of the beautiful Barcelona beach, what could be better? Eclipse is a very popular joint in Barcelona and attracts visitors both local and foreign. The club’s claim to fame is their upper story lounge which provides for a gorgeous view of the sea. Late night the club is packed with people who are looking for a fun night out. The club serves delicious drinks and has a dance floor which is brimming with people who are partying the night away. During the day time, the club is just as full however, this is the time of the day when the tables are more occupied than the dance floor. The club serves up some great dishes with people usually raving about their sushi; considering the place is right next to the sea, you should definitely give their seafood a chance since it will be incredibly fresh. No matter what time of the day you visit Eclipse, you will see a lot of people inside and at times even waiting outside for a chance to get in. This place should definitely be on your bucket list when visiting Barcelona. The club is located at a very coveted spot on the beach. The exact address is Placa de la Rosa del Vents 1, 26th Floor, 08039 in Barcelona. It is quite easy to find especially if you look up the location on Google maps. A VIP table at Eclipse guarantees you two things; immediate entry into the club and the night of your life. The VIP table seats up to 4 people and costs 250 euros minimum. The drinks you get with this are up to a limited quantity of soft drinks and 4 mixers of Red Bull, if you want to order a premium drink and more mixers, you will of course have to pay a little more. The cost of the bottle you order depends on the bottle itself. Your experience will be amazing, that is for sure since VIP tables are located in the best areas of the club and have a designated staff member assigned to them. Make sure you are dressed to impress since even if you have a VIP table at the club, you can be denied entry if you aren’t following the dress code. You can learn more about the dress code below. 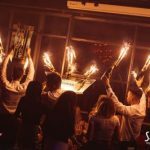 Bottle service usually requires a spend of at least 250 euros. The cost of the bottle depends on the liquor you order. Absolut costs less and certain champagnes will cost you more. The fancier the drink; the more you will have to spend. Eclipse takes its dress code very seriously. It wants to make sure all their patrons look the part of being at an exclusive club. Thus no casual wear such as beach clothes, athleisure or jeans are allowed. Men need to be looking sharp in nice dinner jackets and fancy shoes and women should also look the part with beautiful cocktail dresses and heels.